For their first 10 years in Russia, our priests were involved in the opening or re-opening of a number of Catholic parishes throughout southeastern Russia. At first, each one was pastored by either Fr. Myron or Fr. Dan. Eventually, most came under the care of other priests. However, some are still supported, at least in part, by the mission society. Below is the listing of parishes we have helped to establish. Our church in Vladivostok as it appeared in 1993. The Catholic community of Most Holy Mother of God was begun by Andre Popok, a young Soviet naval officer. Popok converted to Roman Catholicism after reading restricted religious literature as part of his political indoctrinating course to become a Communist political officer. When Fr. Myron and Br. Dan first arrived in Vladivostok, the city had approximately one million people. About 10 were Catholic. The original Catholic parish there had had a congregation of at least 10,000 parishioners. But in 1992 when the priests arrived, things were very different. The few remaining original parishioners had yet to be found. And the church building was in the possession of the government and was in a sad state of disrepair. The first help for the new parish in Vladivostok came from Fr. Joseph Fessio, SJ, in the form of two automobiles and an introduction to e-mail, which was still in its infancy at the time but became a valuable tool for the new missionaries. 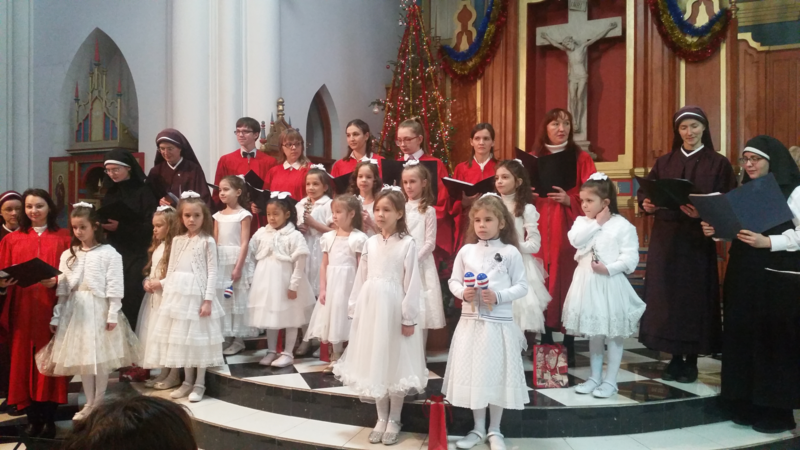 The second help came from American Catholics through the annual collection for the Church in Eastern Europe. The fund gave the parish $30,000 to pay for the initial expenses of receiving the old Vladivostok cathedral and securing it—the second church to be received back in Russia (the first was the church in Tomsk in Siberia). Today, the building belongs to the Catholic parish and has been beautifully restored. In addition, there is now a 3-story rectory/parish office building adjacent to the church. Now, most of our religious and charitable projects originate at this site in Vladivostok, then grow and spread to other parishes. Fr. Myron is the pastor and Fr. Dan is the associate. In 1993, because of the success in locating Catholics in the region, the new parish in Khabarovsk was formed. It was given the name Transfiguration of the Lord. The parish was originally founded in the 1860s. Fr. Myron was appointed the first pastor and celebrates the first Mass on January 26, 1993, with 7 people in attendance. Khabarovsk is a 14-hour train ride, or 450 miles, from Vladivostok, and Fr. Myron initially visits the parish once each month. It was later discovered that the parish was originally named Immaculate Conception, and so the name was changed. Fr. Myron was replaced temporarily as pastor, but now serves the parish again. A more extensive story of the parish is in Issue Number 17 (April 16, 1997) of the Vladivostok Sunrise newsletter. BEN, link to the general newsletter page, not to this particular issue. Do this for every newsletter link throughout the website. There’s no need to go to the specific issue. Fr. Myron started both of these as mission parishes of the Khabarovsk parish and celebrated all of their Masses for a number of years. Eventually, the Maryknoll Fathers came to work in the Khabarovsk parish and followed through with the erection of these two as official parishes. Also in 1993, the parish in Bolshoi Kamyen was established, with Fr. Dan as its pastor. The first Mass was celebrated on June 3, 1993, with about 50 people present. The parish is a 3-hour train ride east from Vladivostok, and Fr. Dan began visiting it once monthly for Mass, confessions, and baptismal preparations. About 7 years later, the bishop officially closed the parish. Founded in 1994, the parish initially served all of Amur State, more than 141,500 square miles, larger than the state of New Mexico. Fr. Myron was named as the pastor. On August 8, 1999, a new priest, Fr. Vladimir Sek, became the pastor. Additional information about the early years of the parish can be found in Issue Number 19 (January 1, 1998) of the Vladivostok Sunrise newsletter. In January of 1995, Fr. Myron celebrated the first Mass in this new parish. Twenty-six people attended, and 15 of them were already Catholic. The parish quickly organized itself and CARITAS began activities. In December 2004, Fr. Bartholomew Szost of Poland became the new full-time pastor of the parish. In March of 2007, Fr. Sebastian D’Silva of India assumed the duties of pastor. The first Mass was celebrated on Saturday, March 7, 1998, with Fr. Dan, the pastor, presiding. Romanovka is a small town, not far from Bolshoi Kamyen. It is a military town where many Chernobyl widows live. Their husbands died after flying emergency mission over the nuclear mishap in Chernobyl. On January 14, 2006, the parish received a new pastor. Issue Number 29 (September 1, 1999) of the Vladivostok Sunrise newsletter has an excellent cover story on the town and parish of Romanovka. The parish was formed in 1998 and quickly became organized with a catechist, an organist, and several young people who had already attended our Children’s Camp and our Youth Conference. On April 6, 2002, Fr. Christian Labanovsky, OSF became the new pastor. On November 11, 2006, the new rectory and chapel were dedicated with Bishop Kiril Klimovich attending. At this point, the pastor was Fr. John Gibbons, OSF. Fr. George Park, the first live-in pastor at Lesozovodsk, with some of the parish children. The city of Lesozovodsk is halfway between Vladivostok and Khabarovsk. In late 1999, Bishop Mazur issued a decree forming the new parish. Fr. Myron was named the pastor and Mr. Alexander Pisarenko was named parish trustee. The first Mass was celebrated February 16, 2000. On April 2, 2005, Fr. Myron installed Fr. George Park as the parish’s first live-in pastor. Later, Fr. Myron again became pastor and remains so to the present. Further information is given in the November 1, 2002 (Issue No. 48) edition of the Vladivostok Sunrise newsletter. In February of 2000, a Lutheran from Ussurisk approached Fr. Myron, saying that they and 18 other Lutherans wanted to become Catholics. The pastor had studied in Rome at the Lateran University and was a Russian citizen. By June, the parish was making steady progress with Fr. Myron as the pastor. On April 21, 2002, Fr. Christian Labanovsky, OSF, became the new pastor, in addition to his pastoral responsibilities at Arsenyev. Further information is available in the January 1, 2000 (Issue No. 37) of the Vladivostok Sunrise newsletter. 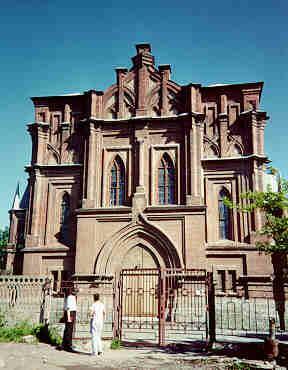 A second Catholic parish was officially established in Vladivostok in early 2003, with Fr. Myron as pastor. In April of the previous year, the mission society helped buy a five-room apartment to serve as the base for the new parish. Additional detail is given in the May 1, 2002 (Number 45) and the May 1, 2003 (Number 51) issues of our newsletter. By September of 2004, we obtained a small apartment in the vicinity of several universities in Vladivostok. Although it is not a parish, the Center’s apartment serves as the point for evangelization, discussion groups, catechesis, and socializing for the student population. In spring of 2006, the Center hosted a 2-day retreat led by four American staff members from FOCUS (Fellowship of Catholic University Students).